The idea that this fall’s cold-stun sea turtle period could be a memorable one occurred to us when turtles began stranding about 2 weeks earlier than usual, in mid-October. 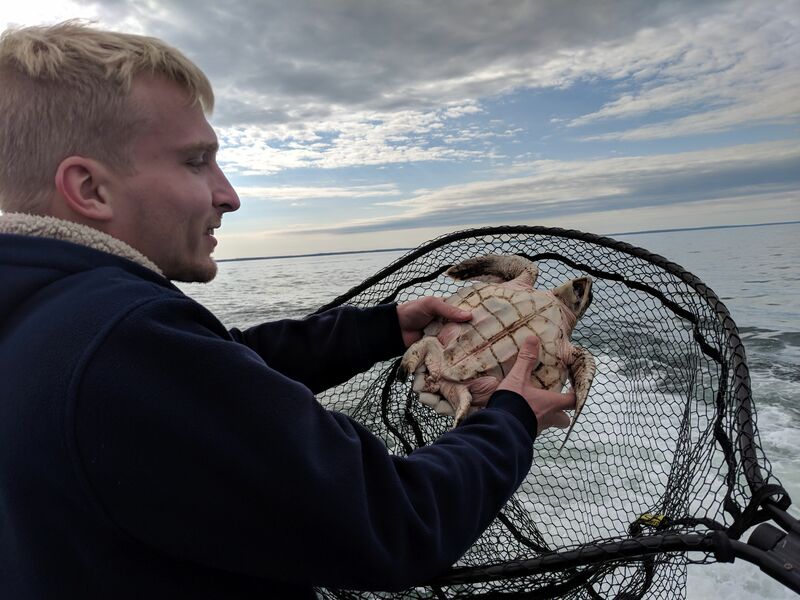 Sea turtle staffer Ben Thyng nets a Kemp’s ridley during a school boating trip off Dennis. Only days before rescuing our first cold, immobile turtles, we’d found several live, swimming turtles out at sea—a pretty unusual occurrence. Our marine life cruise off Dennis netted one lively Kemp’s ridley. A second ridley was discovered not long after that during another school research trip off Dennis. Both turtles represented a special opportunity to study active sea turtles in the period before they likely would have become cold-stunned. Then two more surprises happened. Wellfleet Bay volunteer Sandy McKeen with stranded live leatherback at Ellis Landing in Brewster. (Photo by Jay Hubbell). 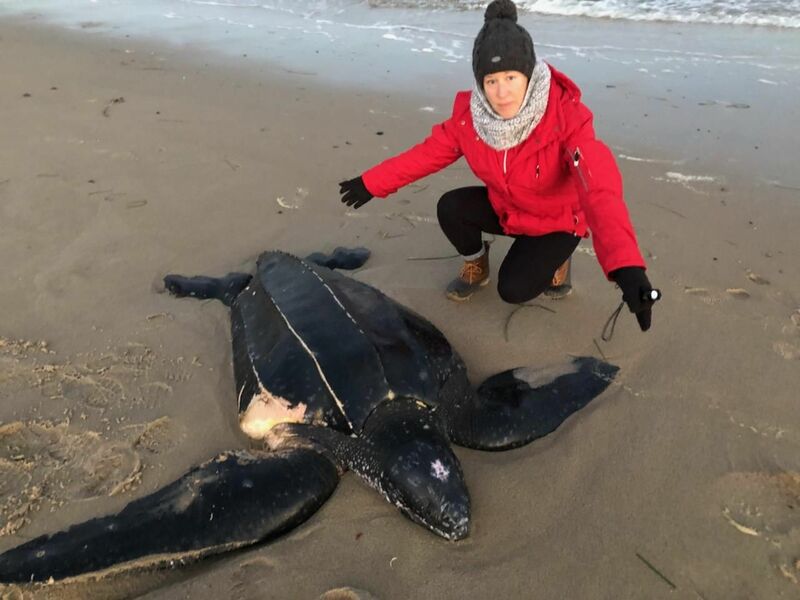 Two young leatherback sea turtles, which are not typically susceptible to cold-stunning in part due to their very large size, stranded in Brewster and Eastham within two weeks of each other. While most leatherbacks that come ashore are dead, both of these turtles were alive. 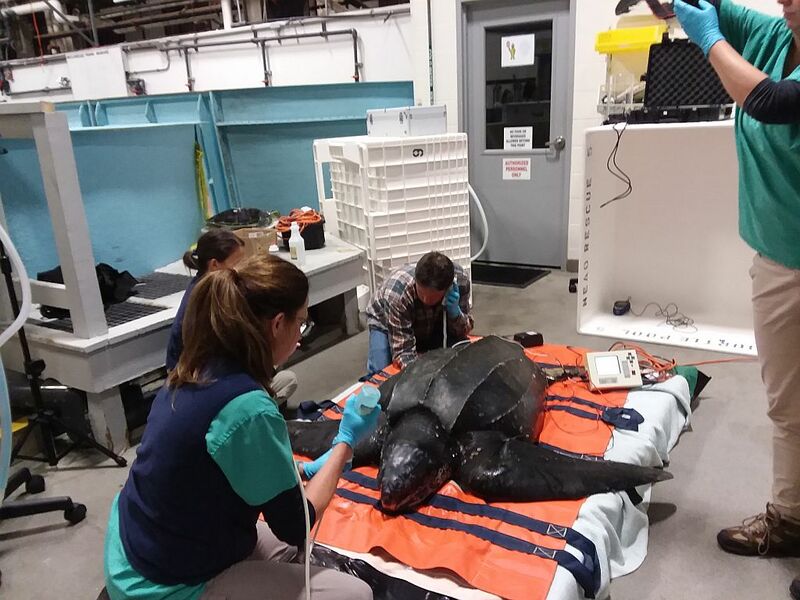 Each animal required special assistance and many hands to get moved from the beach and into a vehicle for trips to the New England Aquarium’s Animal Care Center. Unfortunately, neither leatherback survived. A week before Thanksgiving, traditionally a busy period for strandings, the forecast called for conditions that we knew would be deadly for sea turtles trapped in Cape Cod Bay. Overnight temperatures in the teens combined with northwest winds of at least 30 miles an hour practically guaranteed scores of turtles would come ashore and that most would not be alive. The cold arrived the night before Thanksgiving. On the day before, 87 turtles stranded. Most were alive. By Thanksgiving afternoon, 82 turtles had come ashore and all but about 5 were dead. The dead ones were like blocks of ice, many of them appearing to have frozen as they made a final attempt at swimming. It was depressing. This deceased Kemp’s ridley, like many that came in, looked like it had been frozen in place. The “flash-freeze” event made national and even international news over the holiday weekend. 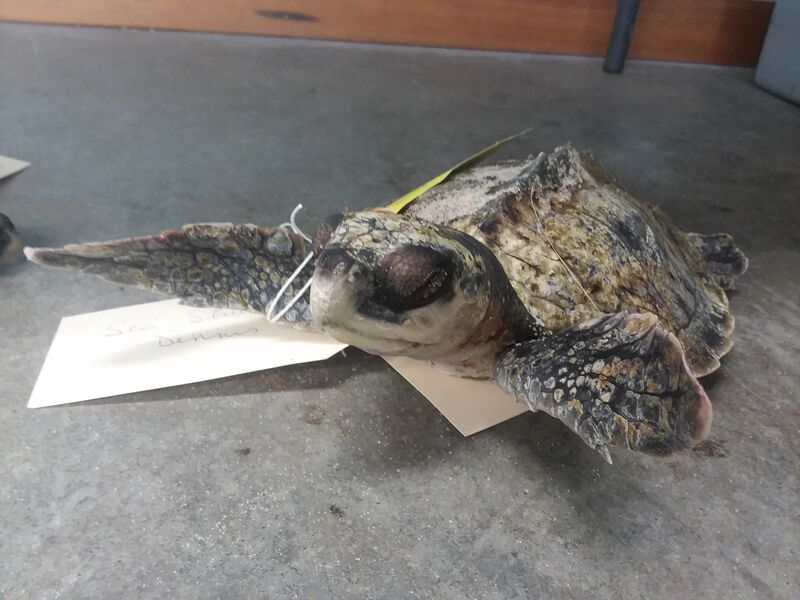 While the turtle die-off was certainly part of the cold weather story, in some cases it was reported as an isolated event and not in the context of the hundreds of sea turtles that already had been stranding due to the bay’s normally cooling waters. 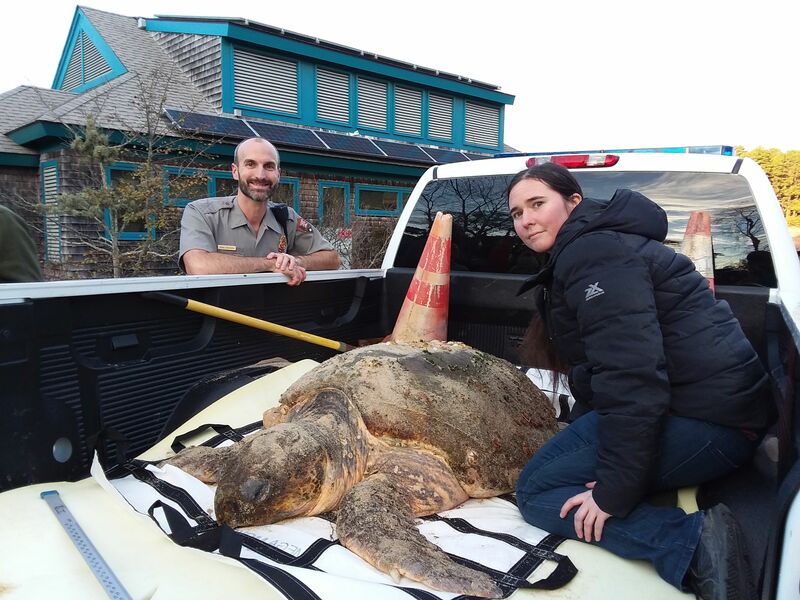 Of course this hefty turtle had to come ashore on Wellfleet’s 6 mile-long Great Island! Thank goodness for Chris Anderson of the Cape Cod National Seashore and his truck! And our friends at the New England Coastal Wildlife Alliance who helped us lift! This fall has had so many twists and turns that we hesitate to offer any more predictions. But it does appear we’re headed for another big year. Not as big as the 1200 turtles recovered in the fall of 2014, but likely our second biggest cold-stun period ever. In the meantime, we’re continuing to do our best to help as many live turtles get the life-saving care they need to return to the sea. Thank you all for your service to save turtles! You’re the best!! Good luck for the rest of the season! And Happy holidays!